Aster’s one-story house in southern Eritrea was painted white and teal. Five front windows overlooked a lawn, where her four daughters could play and donkeys grazed. Her father obtained permission from the government to build in 2002; they began building in 2013. But this September, the military and city authorities came and spray-painted a giant X on the front. Aster (not her real name) gathered her children and left before a bulldozer smashed through the walls. Nothing is left of their home now but rubble. As huge numbers of Eritreans continue to flee the country, Isaias Afwerki’s regime is increasingly retaliating against their families. The government already demands payments from families whose children have escaped—50,000 nafkas (US$3,333) per child. Families who can’t pay are jailed. Now the government is demolishing houses and seizing property, too. “They want to punish people,” says her brother, Fikru, 31, who recently arrived in Geneva after seven years of bouncing between countries as an Eritrean refugee. Fikru, who recounted Aster’s story to me, says his other brothers had sent money from abroad to pay for the construction. Experts say Afwerki needs a constant supply of young people to maintain his police state. A June 2015 UN Commission on Inquiry report on Eritrea documented in detail the regime’s indefinite military conscription. The military has drafted children younger than 15, tortured its own members and engaged in the systematic sexual abuse of women. But despite the report’s conclusion of possible “crimes against humanity”—and an Eritrean government official’s recent admission to a Wall Street Journal reporter that the regime engages in torture—some countries and right-wing political parties in Europe are jostling to send a signal to Eritreans: Don’t come here anymore. In the aftermath of the Paris attacks, many of Europe’s right wing parties were quick to insinuate Syrian refugees were to blame and to call for stricter immigration and border controls. But even before the attacks, some European governments were already maneuvering to prevent refugees from entering their countries. Eritreans—who represent one of the largest groups of refugees seeking safety in Europe in recent years—have been a primary target of those who would close Europe’s doors. Efforts to exclude Eritrean refugees from Europe began over a year ago in Denmark. 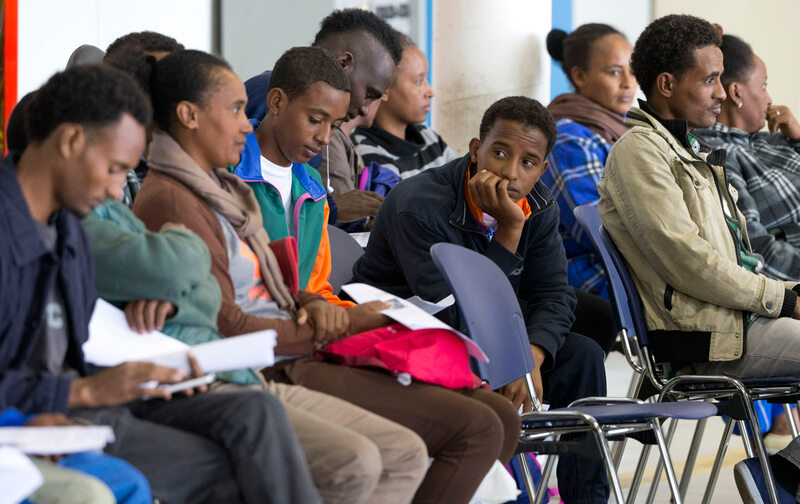 In mid-2014, the Danish Immigration Service embarked on a fact-finding mission to Eritrea after seeing a dramatic rise in the number of Eritreans seeking asylum. The mission report—based primarily on anonymous interviews in Asmara—declared conditions had improved enough that Eritreans would no longer be recognized as refugees in Denmark. Human rights organizations denounced the report, and two men who contributed to it resigned, saying they were pressured to ensure the report allowed Denmark to adopt stricter asylum practices. After a period of public pressure, the Danish government announced Eritreans would still receive asylum in Denmark, but the report remained public. Then in March 2015 the UK Home Office changed their asylum guidance for Eritreans using the Danish report as its key source; the recognition rate for Eritreans subsequently dropped from 73 percent to 29 percent. "The government’s statements were definitely made to send signals to Eritrean asylum seekers not to come to Norway." Professor Gaim Kibreab, director of refugee studies at London South Bank University, was the sole academic interviewed for the Danish report and then went on record to denounce it. “What can you do when governments don’t care about principles or rights?” said Gaim in a phone interview. “There’s a competition in the EU on who is harsher on asylum seekers.” Gaim says most Eritreans who were recently denied asylum in the UK are now appealing. Keetharuth also noted there has been no talk of demobilizing those currently in the military–some serving for more than 15 years. Keetharuth has requested permission at least four times to enter Eritrea, most recently in August 2015, to independently assess the situation inside the country. Each time her visa application has been denied. The November 6 Facebook post from Norway’s Ministry of Justice is the latest in a string of moves by the ministry, which is led by a minister from the right-wing Progress Party. There are presently 13,246 Eritreans seeking asylum in Norway, and Eritreans were the largest group of asylum seekers until this year, when Syrians surpassed them. Norway’s actual asylum proceedings have not yet changed; 99 percent of Eritreans who applied for asylum so far in 2015 received protection. But in June, Jøran Kallmyr, state secretary at the Norwegian Ministry of Justice and Public Security, visited Asmara to discuss a “return agreement” after publicly commenting that Norway might alter its asylum policies for Eritreans. Kallmyr then stated that, “Eritrea has lost a large part of its youth population because of European asylum policies.” His comment echoed what Afwerki has long claimed publicly: that his regime is not to blame for the exodus. “The government’s public statements were definitely made to send signals to Eritrean asylum seekers not to come to Norway,” said Florentina Grama, an advisor at the Norwegian Organization for Asylum Seekers in Oslo. Grama, speaking by phone, said the majority of Eritreans apply for asylum based on the indefinite national service, and a few for religious persecution. The Eritrean government only recognizes four religions: the Orthodox Church of Eritrea; Sunni Islam; the Roman Catholic Church; and the Evangelical Church of Eritrea. Those who practice other religions have to report their activities to the government, facing torture and detention. The recent Valletta Summit on migration made clear the EU would continue in this vein, as well as attempting to leverage development funding to force African countries like Eritrea to allow EU countries to return failed asylum seekers. In October, I spoke with Hayat (name changed to protect his identity), a 16-year-old boy from Eritrea who recently arrived in Switzerland. To get here, he had traveled for days across the Sahara, crammed in the back of a truck. Two people from his group died when their truck flipped; one was a pregnant 16-year-old girl. The accident left the group stranded for four days in the blinding heat. Later, Hayat was forced to stay in underground caves in Libya while his group was bought and sold by different smugglers. When European countries helped create the 1951 Refugee Convention in the aftermath of World War II, they realized that people fleeing persecution deserved protection. They also recognized the right not to be returned to a place where your life or freedom is threatened. Over the past few months, that right has been put in jeopardy as European countries have manipulated asylum systems so that it matters more where you flee to, rather than what you flee from. Caitlin L. ChandlerTwitterCaitlin L. Chandler is a writer based in Berlin and an editor at Africa is a Country.